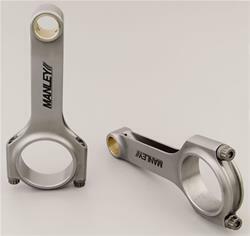 Manley H-Beam 679g Rods ARP 8740 03-up Mopar Gen III Hemi [Manley 14087-8 Connecting Rods] - $619.99 : 3rd Strike Performance, Your Source for Late Model MOPAR Performance Parts and Accessories! Manley steel H-beam connecting rods are made from forged 4340 steel alloy. They're packed full of performance features, such as a compact uniform-grain structure for ultimate strength, full machining, stress relieving, and magnafluxing. The wrist pin and big end bores are honed to a +/-.0002 in. tolerance, and the wrist pins get a bronze alloy bushing. These units include cap screw ARP 8740 alloy rod bolts, and each rod set is weight-matched to within 2 grams. Connecting Rod Length Center to Center (in): 6.240 in. Big End Bore Diameter (in): 2.2520 in. Big End Width (in): 0.933 in. Pin End Bore Diameter: 0.984 in. Pin End Width (in): 1.000 in. Notes: Features stock 6.1 Hemi pin diameter.